Does God really expect us to get along with each other? What do we do when we don't see eye to eye with leaders? Is Biblical unity and loyalty obtainable? How should we respond when others frustrate or irritate us? Learn how it is possible to get along with others. 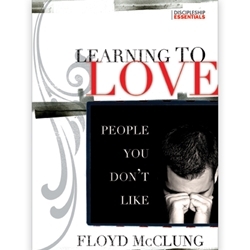 Floyd McClung, Jr. offers challenging and practical answers for learning how to get along with others and achieving productive, lasting relationships. Here is a first-hand account of how anyone can live in love and unity with others, both in the church and in the world. This book challenges readers to re-evaluate their understanding of Christian unity and clearly shows the path to love and reconciliation that God calls every Christian to follow. Includes a study guide in the back of the book. Part of our Discipleship Essentials series.